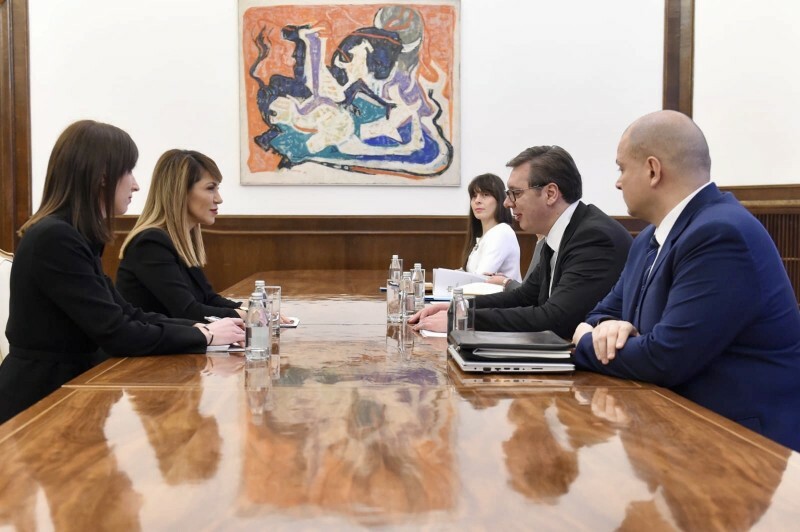 Belgrade – At the beginning of the two-day official visit to Belgrade, the Secretary General of the Regional Cooperation Council (RCC), Majlinda Bregu met with the President of Serbia, Aleksandar Vučić, today. Secretary General Bregu and President Vučić had a frank and constructive discussion on the regional cooperation in the Western Balkans and agreed that region needs to move forward on the European integration agenda. The discussion focused on the Multi-annual Action Plan for Regional Economic Area (MAP REA) agreed by the Western Balkans’ Prime Ministers in Trieste 2017 that envisages greater connectivity and mobility and more investments in the region. This specifically refers to new Regional Roaming Agreement (RRA2) for the Western Balkans, leading to zero roaming cost by 2021, and the agreement on mutual recognition of professional qualifications in the region for Doctors of Medicine, Dentists, Architects and Civil Engineers. President Vučić said that Serbia would continue to be a constructive partner of the RCC thus contributing to strengthening of the regional cooperation and progress of the region. “It is our mutual interest to move forward as a region that speaks clearly that we need each other. The most effective approach to integration of Western Balkans is to pursure mobility, zero roaming tariffs, trade and investments, towards the regional economic area“, said Bregu.